Without further ado, I am most pleased to introduce the lovely and talented (and very brave!) Kristina Matthews! Cotton. I go for comfort over style. Kevin Costner has long been my back up plan. 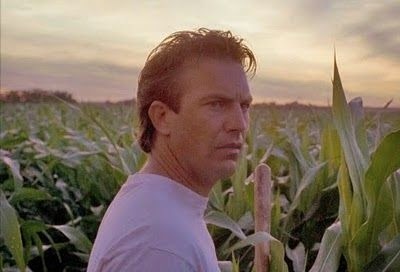 But unfortunately for Kevin, my first choice has stuck around since he took me to see Field of Dreams when it first came out. A lot of baseball players come from Latin America, so there is a lot of Spanish spoken in the dugouts. I only speak enough to order in a Mexican restaurant. Uno mas cerveza por favor. I still remember meeting my husband for the first time. Our eyes met, and there was an instant connection. He said he wanted to be “Just friends.” We’re still best friends, lovers, partners, and teammates after 25+ years. Definitely NOT Pictionary. We almost broke up over a game in college. Probably a word game like Scrabble or Balderdash. Although Cards Against Humanity is pretty funny. 6. I *heart* Peter Cetera. What song immediately swoops you back to your “first days” of falling in love? Our song was Randy Travis’ Forever and Ever, Amen. But we’ve started every road trip with Jimmy Buffet’s Cheeseburger In Paradise. We’ve been on a lot of road trips. 7. Most romantic or sexiest destination out there. We’re road trippers. My husband loves the desert. I grew up in the mountains. Our first trip together was a three-day rafting trip without a tent, and of course it rained the whole time. We’ve camped on the North Rim of the Grand Canyon where the only sign of civilization was the Giants game on the radio. We’ve rented a beach house with the whole family (thank goodness for large closets), celebrated my husband’s 40th Birthday in Cabo with his high school friends, we’ve split far too many Anchor Steams at Lefty O’Doul’s bar in San Francisco after a Giants game, and we’ve even spent ten days in a motor home travelling through Alaska with his parents, our 15 month old son, and my brother-in-law and his wife. All of these trips were romantic in different ways. Even the Sleepy Time Inn in Montana where the sheets were practically see-through and I slept in pajamas on my honeymoon was a great memory. 8. I wanted to be a helicopter pilot and a cowgirl when I grew up (still do). What did you want to grow up to be when you were a little girl? A baseball player, of course. I still have my “School Days” scrapbook. When I was in second grade, there were two lists of occupations. One for boys and one for girls. I checked off baseball player from the boys list, but circled the word “Girls” and drew an arrow to what I wanted to be when I grew up. I was the girl playing kickball in patent leather Mary Janes, with my hair tucked under a ball cap who would kick any boy in the shins if he tried to harass me. Mexican Chocolate. Alternately, Salted Caramel. Such a huge pleasure to have a fellow Sassy as a Nut this week. It's been much too long!! Miss Kristina is a fellow sports romance writer, too, and I can totally appreciate her own passion for a sport. My love - rugby. Hers? Baseball. I personally don't watch much of it, but I'd go see a live game in a minute. Nothing like hanging out in a stadium to watch any live sport - the buzz, the hotdogs and beer, the music, the people. Fabulous. My favorite this week is Miss K's answer to #8. I got this great visual of her in a pair of dusty black Mary Janes, running the bases, pumping those arms, proving to the boys there isn't much a girl can't do. Love it. I see so much romance in the lives of my Nuts, whether they always see it or not. Here, her romance and relationship with her husband shines through her words, and I think that is one of the most romanctic love stories ever written. No matter what we are trying to accomplish on the page. You are a very lucky girl, Miss Kristina! MAKING A COMEBACK is Book 3 from Kristina's More Than A Game series. The cover is just hot off the press, and the book is now up for pre-order! Or do check out her author page with Kensington for the other books in the series that are out now! Thank you for hosting me. And here I always thought my real life love story would be boring. Not enough conflict (except for that Pictionary game). I love #8 too! I kicked my fair share of boys in the shins during kickball games. Love the cover, Kristina! Great answers, Kristina. Really looking forward to reading this one. Cd, So glad this blog is also making a comeback.